Laura Henderson saw establishing an urban garden near downtown Indianapolis in 2010 as a real opportunity to engage, educate and inspire a whole new audience to think about where their food comes from, how it grows and to share the ideals of the Indy's burgeoning Slow Food Movement. 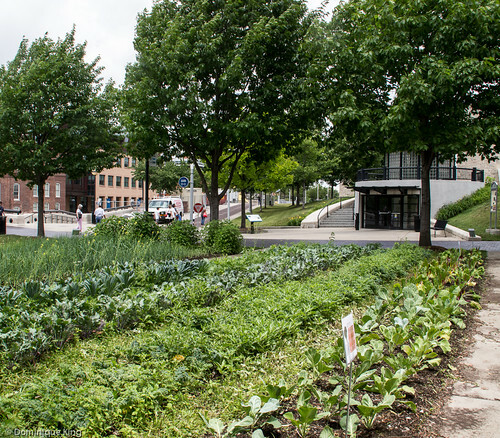 The Wishard Slow Food Garden at White River State Park is a 6,000-square-foot farm plot tucked between a large hotel on Washington Street and the Indiana State Museum. 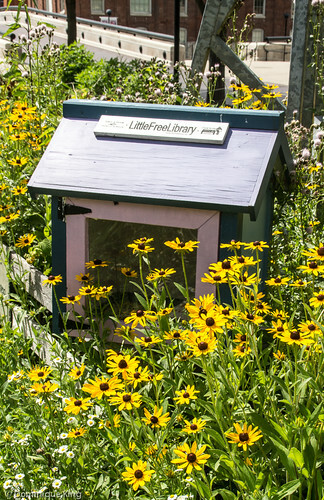 The garden is one of a number of garden plots run under the auspices of the Wishard-Eskenazi Health system and the non-profit Growing Places Indy organization. Growing Places Indy grows more than 60 types of fruits, veggies and herbs each year, with the majority of those items coming from the Wishard Garden each season. This garden is much more than a lovely green space in the middle of the park--it is a highly visible demonstration that draws attention to Indy's Slow Food movement, allowing and encouraging visitors to stop, ask questions and lean how they can forgo the standard diet dominated by fast food and to eat better and feel better about themselves and their health. Urban gardens are not new to us in metro Detroit where urban activists learned long ago how to take advantage of an increasing number of vacant lots to create community gardens as neighborhood projects, plots tended by local restaurants to grow part of their own menus and any number of other efforts to promote the "Farm to Fork" movement. 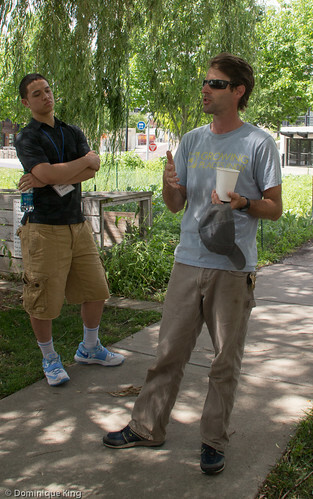 We met Laura's husband Tyler tending to the Wishard Garden during our recent visit to Indianapolis. We mentioned being from the Detroit area and how urban gardens are increasingly changing the Motor City's landscape (often quite literally) and local food scene, and he noted that Detroit is "ground zero" for the idea of promoting urban gardens. The plant beds here represent a number of ways to eat local--joining a Community Supported Agriculture (CSA) group, growing your own food, supporting restaurants that feature locally grown produce and shopping at farmers markets and grocers that source food locally. (We sampled some of the food when we ate lunch at the Indiana State Museum provided by the museum's Farmers Market Cafe). The food produced here isn't qualified as "organic", but the Hendersons and their crew make it a point to follow sustainable growing practices. The crew at Wishard Garden employs a crew made up mostly of college-age interns and volunteers to plant and maintain the gardens as well as run a number of programs to draw visitors to the plot and promote the ideas of producing food that is "good, clean and Fair (as in following Fair Trade practices)" for all. Farm stand sales, a schedule of weekly CSA pick-ups through the height of the summer growing season and partnerships with local food truck owners who occasionally visit and feature "park to plot to plate" menus made with food grown at the garden allow visitors ample opportunity to taste some of the food grown at Wishard Garden. Events like yoga or meditation sessions in the garden are another way to involve the community in learning more about the garden and advancing the goals of always improving and educating the public about community health. 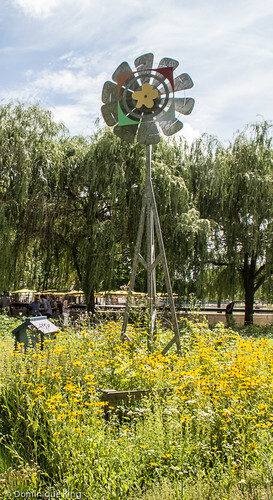 We loved the idea of the garden as a green oasis in the park that encourages visitors to drop by to chat or just linger awhile. 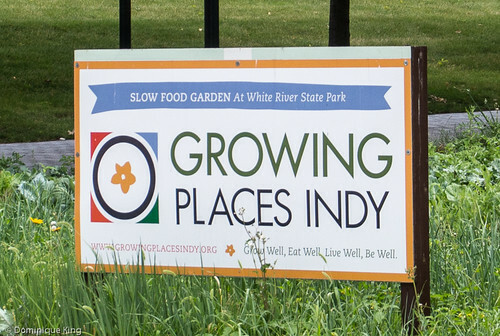 Connect with Growing Places Indy on the Web, Facebook or Twitter.